Luke Herzog's goal broke a 1-1 tie and two late goals sealed a 4-1 victory in the Class 2A, Section 3 final. St. Thomas Academy pulled away from Eastview for a 4-1 victory in the Class 2A, Section 3 final Thursday at Braemar Arena in Edina. Luke Herzog’s sprawling goal gave STA the lead 2 minutes, 13 seconds into the third period. Herzog added an empty-netter with 23.3 seconds left and senior Ray Christy scored eight seconds later to ice the Cadets’ 10th section title in 14 seasons. 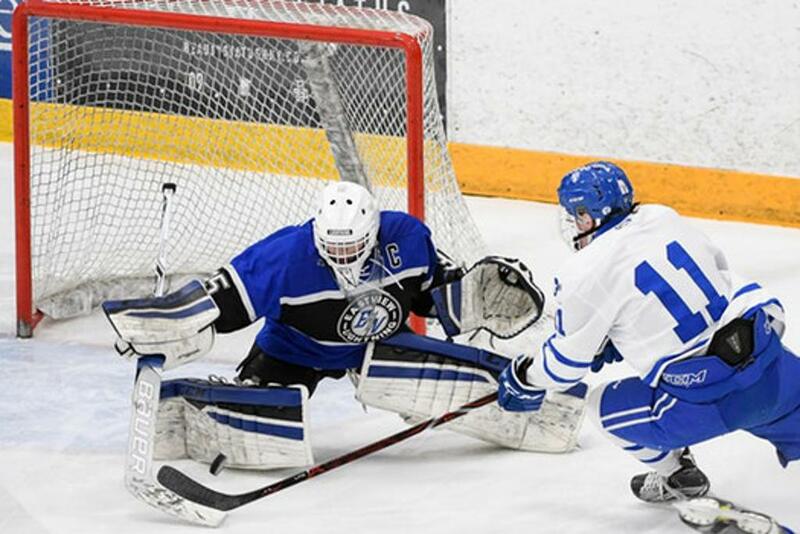 Cadets senior goaltender Atticus Kelly, a Frank Brimsek Award finalist, stopped all 13 of Eastview’s third-period shots to preserve the lead. He finished with 34 saves. Despite being outshot 12-4 in the first period, Eastview seized momentum late and carried it over into the second. The Lightning finally scored when Zach Anderson’s slap shot trickled through Kelly’s legs at the 11:59 mark to put the South Suburban Conference champions up 1-0. The Lightning led for over 10 minutes before Cadets senior Chase Foley tied the game with his fourth goal of the section tournament. Fourth-ranked St. Thomas Academy pulled away from Eastview for a 4-1 victory in the Class 2A, Section 3 final Thursday at Braemar Arena in Edina. Luke Herzog’s sprawling goal gave St. Thomas Academy the lead 2 minutes, 13 seconds into the third period. Herzog added an empty-netter with 23.3 seconds left and senior Ray Christy scored eight seconds later to ice the Cadets’ 10th section title in 14 seasons. St. Thomas Academy (25-2-1) posted a 12-4 shot advantage over the first 17 minutes, but skated off the ice with the score still deadlocked at 0-0. Herzog swatted a rebound into the net just over four minutes in, but the goal was immediately waived off for high-sticking. Despite the lopsided shot count, Eastview seized momentum late in the first period and produced a couple of close-range scoring chances that were turned away by Kelly. The Lightning carried that energy over into the second and out-shot the Cadets, 18-13. They finally scored when Zach Anderson’s slap-shot trickled through Kelly’s legs 5:01 into the second to put the South Suburban Conference champions up, 1-0. The Lightning (23-5) led for over 10 minutes before Cadet senior Chase Foley tied the game with his fourth goal of the section tournament.